This book explores the story of the strangest man in Hollywood, and how his eye-catching films coined a new visual language. The quirky gothic stylings of Tim Burton are explored in this unofficial career retrospective that fans will love. For one man to lend his name to a whole visual style is a rare thing in today’s interconnected world, where everyone has an opinion about everything. And yet, as this book points out, describe motion graphics or pencil drawings as “Burtonesque” and people instantly know what you mean. It’s a great starting point for exploring the story of a unique individual, who once gathered a rabble of kids in a local park, then instructed them to make piles of debris and dig weird footprints in the ground. They then waited for some other kids to show up and convinced them that an alien ship had landed. This well-chosen anecdote is the first shot in a biography of Tim Burton that tries to get the bottom of what makes him tick. While there are no new revelations in this ‘unofficial and unauthorised’ book, it does trace the tale of Tim and his films in a well-researched, workmanlike way that doesn’t miss out anything important. The Corpse Bride featured the vocal talents of long-time Burton collaborator Johnny Depp. Indeed, even if this book were text-only it would still be worth a read. 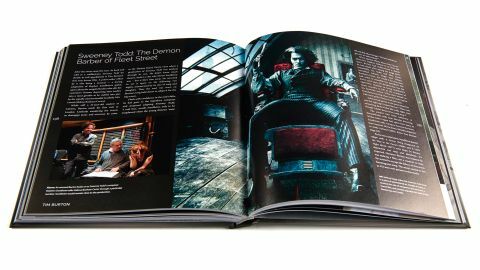 But thankfully it’s also packed with beautiful film stills and promotional art that helps to properly convey the Burton magic, along with some behind-the-scenes photography of the director at work. After covering his early years and entrance into the world of film making, the book takes us, one by one, through the making of 19 of his big-screen productions, from Pee-Wee’s Big Adventure to current release Miss Peregrine’s Home for Peculiar Children. We learn, for example, how The Nightmare Before Christmas was inspired when Burton, as a boy, watched his local department store window transform from a Halloween display into a Christmas tableau; and how a proposed Beetlejuice sequel was planned to be a “German expressionist beach movie”, set in Hawaii. It’s the bride and nightmarish groom… Beetlejuice brought the Burtonesque look to a wider audience. Note that this not an ‘art of’ book, so there are no preparatory sketches or concept artworks on show, unfortunately. However, the imagery throughout the book is well chosen and evocative of the narrative themes, plus there’s a useful eight-page gatefold in the centre to keep track of Tim’s film timeline. Special touches like this, and the sumptuous dark-silver slipcase, give this 180-page hardback something approaching a premium feel, although we do think the cover price is still a little steep for what’s on offer. But for Tim Burton enthusiasts, and film fans in general, there’s a lot to like here. This article was originally published in ImagineFX magazine issue 142. Buy it here.